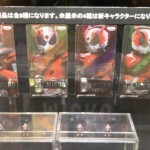 While Toy Fair is on going, another toy show is under way overseas: The the 2015 Prize Fair with Banpresto’s reveals from the event. 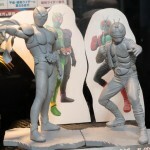 Kicking things off, Banpesto revealed a new series of fix posed figurines Cross Heroes Vol.1 will include Kamen Rider V3 and Kamen Rider 000 while Vol 2 is shown to be W Cyclone Joker and Kamen RIder 2 each figurine will be displayed on a base that resembles stone. In addition we have the Creator X Creator line with Faiz and Faiz Axel form though at the moment no release date or price was given for these pieces. 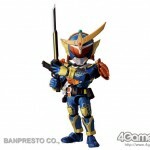 Banpresto Prize Fair: Kamen Rider Reveals! 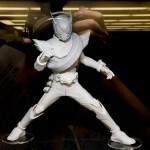 Shifting gears from Tamashi Nation to the Banpresto Prize Fair, Banpresto unveils their Kamen Rider Drive offerings. And we start our engines with the D-Solid Heroes Drive Type Speed fixed posed statues one in his signature “Let’s go for a Ride” pose as well as holding the Handle Sword at the ready. For WFC collectors, Drive kicks off with Type Speed, Wild, Cab, Proto Drive, and finally: Machin Chaser, additional release info was not revealed at the show. Revving up for the premiere of Kamen Rider Drive, Banpresto’s got some new reveals coming from Prize Fair 2014! Micro Series Vol.5 featuring Drive and is four various forms. And finally, a DXF Figure of Drive due out sometime January 2015. As a self-proclaimed giant Kamen Rider Gaim fan, I had no qualms with purchasing this statue from Banpresto! What I didn’t expect was just how amazing this statue is – both with the details and the overall quality – and it is now become a centerpiece for my Kamen Rider Gaim collection! Standing at over a foot tall with the stand, the statue is hallow making it light weight. The paint is, for the most part, perfectly applied (there’s some smearing on the leg paint where there’s gold on the criss-cross pattern of his suit). 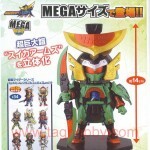 But the details on everything from the visor, the Sengoku Driver, the Pine and Ichigo Lockseeds, the Musou Saber, and the armor itself makes this statue a must-own for any die-hard fan of Kamen Rider Gaim. Click the title of the story to see more pictures, and to see all 30+ images, click on the discussion link on the bottom of the thread! This thing is beautiful and very affordable – what are you waiting for? Sound off and share your thoughts! Banpresto has a juicy announcement for us…with the announcement of Kamen Rider Gaim: Orange Arms making a splash in the R/D Real Deformed toy line. The R/D Line is offered as a prize figure in video arcades throughout Japan…because of this, the exact price of the figure isn’t known but we do know that the toy will be in circulation starting February. 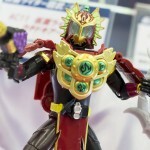 If the DX Watermelon Arms seems out of reach to you, Banpresto’s revealed a perfect substitute. 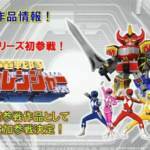 While it might not transform or have much in the way of articulation, Banpresto did reveal that they will be making a Suika Arms to go with their super deformed WFC line. Price and Release dates will be announced at a later date, but we do know that the figure will stand 14mm tall to be properly in scale with the rest of the figure waves. 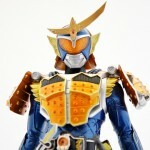 Banpresto has a new line of Kamen Rider trading figures in store for us! At prize Fair 2013, they unveiled a new line called UFC Micro, and Volume 1 of the series will have Heisei era Kamen Riders from Kuuga all the way up to Gaim represented in a microscopic form. At 15mm, the figures are barely bigger than a man’s finger and an impressive amount of paint work and detailing went into these tiny figurines. They will be in circulation starting June 2014.